If the tights fit, you must commit, I thought wryly. I emerged from the fitting room to find the only other customer in the store waiting for me. “I’ll take ‘em,” I told Katie. Relieved to have found my size (on clearance — he shoots, he scores! ), I paid quickly and we hustled out of the REI and into the frosty West Des Moines night, the helpful green-vested team member locking the doors behind us. The last thing I’d expected, 11 hours before I’d be running my second marathon of the weekend, was an impromptu visit to REI on the outskirts of town minutes before closing time. Then again, the second-to-last thing I’d expected was that the race day forecast in Des Moines would suddenly dip below the 30°F mark, after we’d already boarded the plane from Los Angeles. Meaning my cold weather running layers were nestled all snug in their closet at home. I’m no fan of running in tights; I live in Los Angeles, after all. But with roughly the same amount of body fat as Wile E. Coyote and an immune system already compromised by the Kansas City Marathon earlier in the day, I didn’t want to do anything stupid(er). I hadn’t raced in temperatures this cold since I’d last run in tights, and that had been in Antarctica 5½ years earlier. 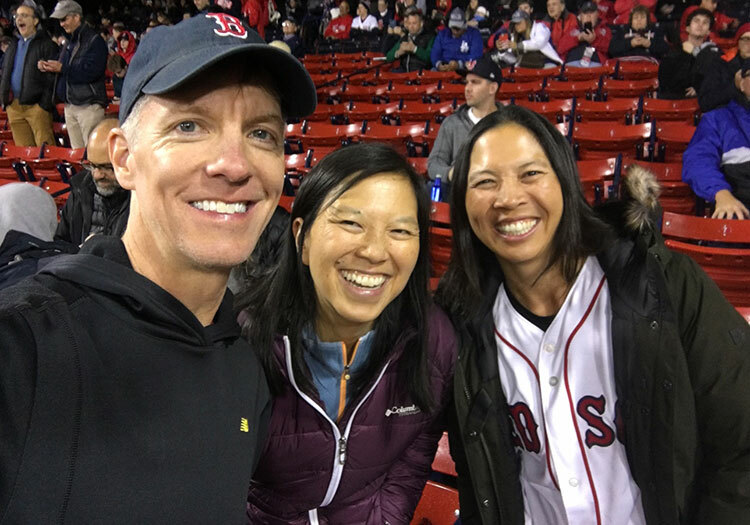 As added incentive thanks to Katie’s sister Kristina, I needed to stay healthy for Game One of the World Series in Boston on Tuesday, less than 72 hours away. And if that had required running 26.2 miles in an aseptic sumo suit, I would happily have done that too. So yeah, like I said — bring on the tights. So far, so good, find a rhythm, I thought as we retraced our steps back across the Des Moines River. The modern brick facades of downtown Des Moines rose up to greet us on our return. Where’ve you been? they seemed to say. We haven’t seen you in minutes! Though my new tights felt good in the crisp, clear morning air, here in the early going my legs clearly didn’t have their usual springiness, and I was laboring to stay with the 3:55 pace group. Certainly the cold weather had something to do with my struggles, but more to blame was the previous day’s effort in Missouri. Time would tell whether — and to what extent — I could shake Kansas City out of my legs. And therein lies the “challenge” of the I-35 Challenge — two marathons in two states in two days, 200 miles apart. Missouri on Saturday, Iowa on Sunday. 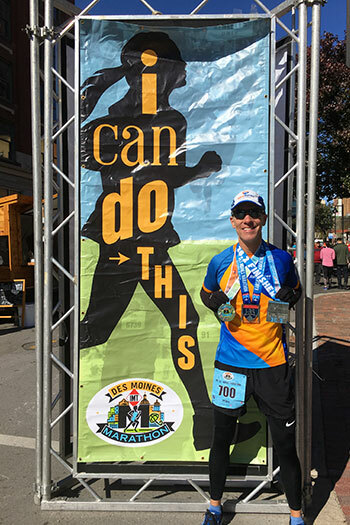 Two of the best marathons in the Midwest in a single weekend. 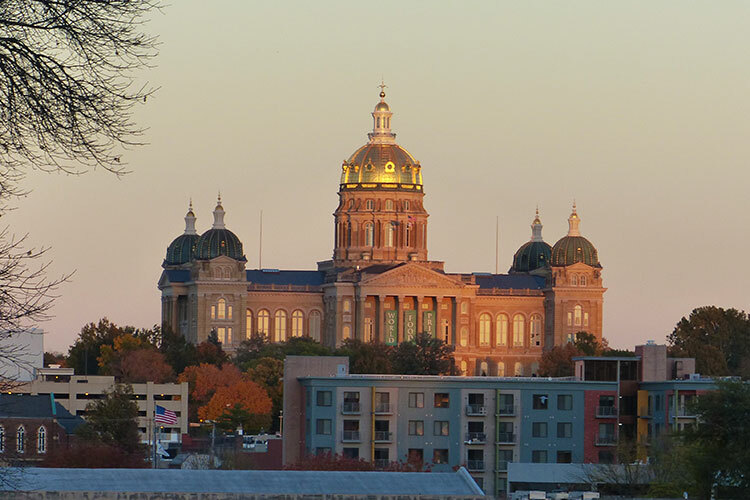 Rewind to Saturday, and after a quick post-race lunch in Kansas City followed by a smooth drive north on I-35, we’d rolled up to Hy-Vee Hall in Des Moines (site of the Scheels Sports & Fitness Expo) as the last rays of sunlight danced warmly on the Iowa State Capitol building, its golden dome shining like King Midas’ crown. Unfortunately most of the expo vendors had called it a day by the time we arrived, but we were able to stop by and say hello to our buddy Blake Boldon, the tireless Director of the Drake University Relays and Drake Road Races and the former Executive Director of the Indy Monumental Marathon. On our way out we also purchased several raffle tickets in support of one of our favorite organizations, Special Olympics Iowa. And the full-zip Leslie Jordan jacket (rather than tech shirt) I received with my registration is one of the sweetest pieces of swag in my wardrobe. Nicely done, Des Moines! Knowing better than to push the pace this early I dropped back, content to run on autopilot behind the 4-hour pace group. I needed to play it safe so I’d still have gas in the tank at the end. 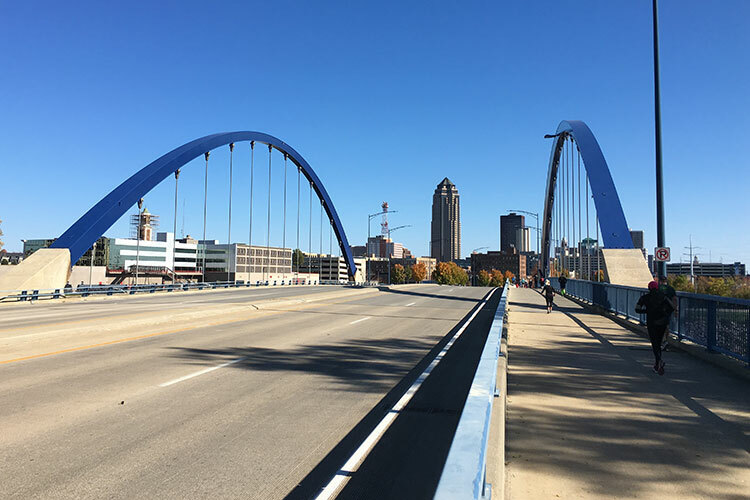 My most important consideration today had nothing to do with the clock — rather, I wanted to soak up the scenery and enjoy my 26.2-mile tour of Des Moines. Because there’s no better way to see a new city than on foot. Runners around me chatted away. Lively conversation is common in the early, feel-good stages of a marathon and one that typically diminishes as fatigue sets in, before ceasing altogether in the final stages as the body shifts into survival mode. 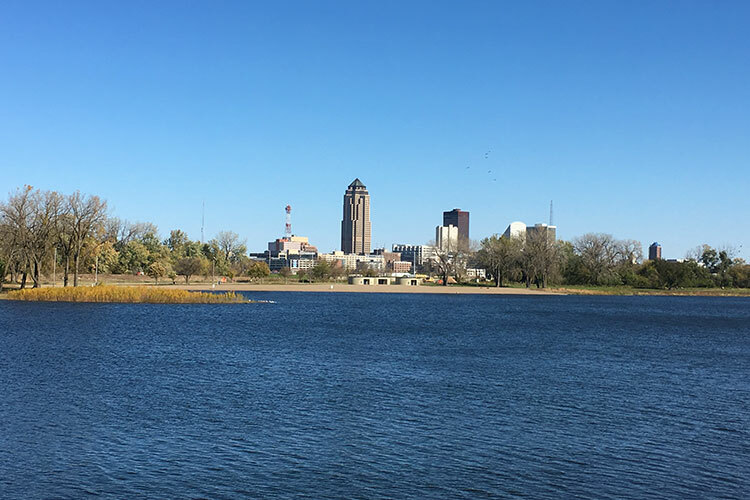 And speaking of shifting, the constant shifting of gears on Des Moines’ rolling, residential course — up, down, up, down — exposed and exacerbated the heaviness in my legs, the endurance equivalent of pouring salt on an open wound. C’mon legs, show me what you got! The real surprise so far, as someone visiting Kansas City and Des Moines for the first time, had been the decidedly non-flat terrain — who knew these two cities were so hilly? Unlike Kansas City, though, most of the hills in Des Moines’ clustered in the first eight miles. 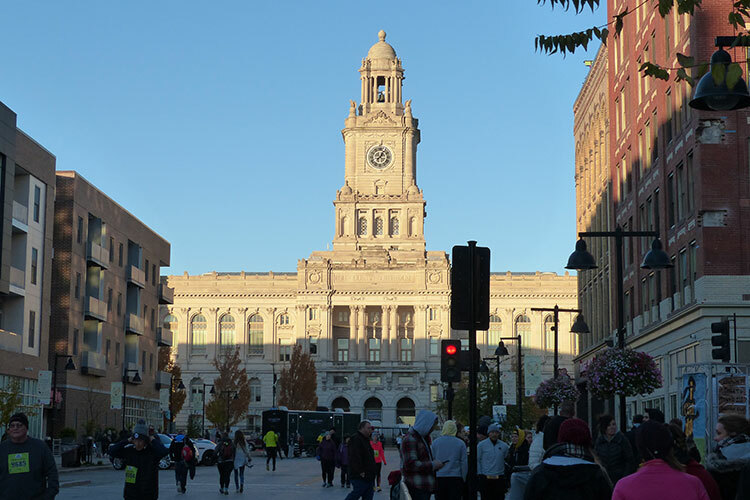 I’d definitely appreciated the tights on Sunday morning during the frigid 10-minute walk from our hotel to the start line, erected in the shadow of stately Polk County Courthouse. Our start time would be a leisurely 8:00am, presumably in support of all the I-35 Challenge runners for whom that extra hour of sleep would be bigly yuge. And despite a restless night’s sleep thanks to the usual post-marathon one-two punch of elevated core temperature and immunosuppression, I felt remarkably good as I bid Katie farewell and diffused into the start corral. Certainly I felt better than the poor woman who then stepped up to the mic and proceeded to forget the words to the national anthem. Not being the superstitious type, I hadn’t taken that as a bad omen. I just wanted to start running so I could stop shivering. Being skinny has both its benefits and its drawbacks. Now entering mile 5 and like déjà vu all over again, the rousing theme from Rocky blasted from a set of loudspeakers on a front lawn, just as it had in Kansas City. Its sheer volume drove us onward while driving the overmatched speakers to the brink of distortion. 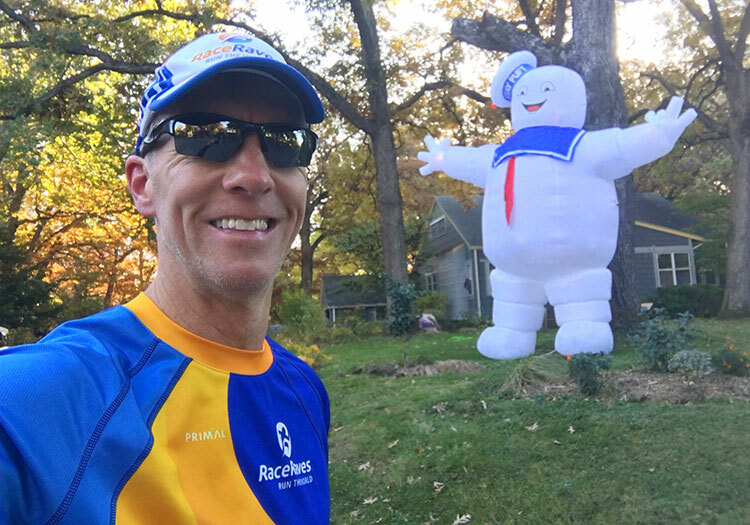 That same mile also featured one of my more whimsical race-day sightings — an enormous inflatable Stay Puft Marshmallow Man of Ghostbusters fame, standing guard over another front yard with his unnervingly cheery smile and with arms open wide, as if inviting each and every runner into his sugary embrace. 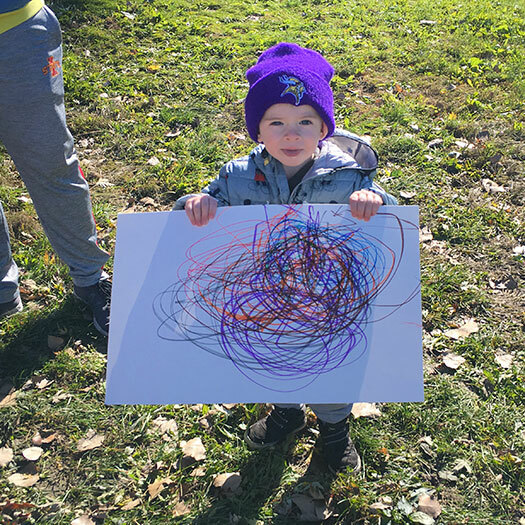 Running near the 3:55 and 4:00 pace groups for a time, I marveled at the proficiency of the pace leaders — with a steady stream of insights and encouragement, they constantly let their charges know what to expect from the course and from themselves. Pacing is a tough job, and while it’s one thing to sacrifice your own race day to help others attain their goals, it’s even more impressive to do it with such poise, confidence and consideration. Having a good pacer to steer the ship can make all the difference between seizing the moment and throwing in the towel when the going gets tough. Though my legs likely would have stomached a sub-4 pace, my stomach — typically my canary in the coal mine on race day — had other ideas. As soon as I’d start to feel good and speed up, my stomach would roil restlessly like a ball bouncing on a seal’s nose, as if to remind me that it, too, was still recovering from Kansas City and that we were in no hurry. Luckily the course featured porta-potties aplenty. My first pit stop in mile 10 lasted roughly two minutes, during which I felt like a performer in Cirque du Soleil: Marathon, awkwardly navigating three layers — tights, shorts and elastic SpiBelt around my waist to hold my iPhone — with not just unwieldy gloves but with frigid fingers that simply didn’t work well in the cold, much less in such a cramped, confined space. But the two minutes was time well spent, and exiting the plastic, phone booth-sized box onto a residential suburban street I took a deep breath, gauged my stomach’s temperament and focused on running comfortably. Which, for now at least, was easy enough on this Norman Rockwell-type course and with the worst of the hills behind us. Not only that, but the best was still to come. Next up: Drake University. For me, the Drake blue track in mile 12 was the course highlight. The disembodied voice of our pal Blake Boldon on the PA system welcomed runners as we entered the track and called the action from the booth as we made a single ¼-mile lap on the bouncy, vulcanized rubber surface. A few spectators (Katie included) cheered from the bleachers, and I glanced around the stadium like a kid visiting Disneyland for the first time, trying to slow down time while I soaked it all in. 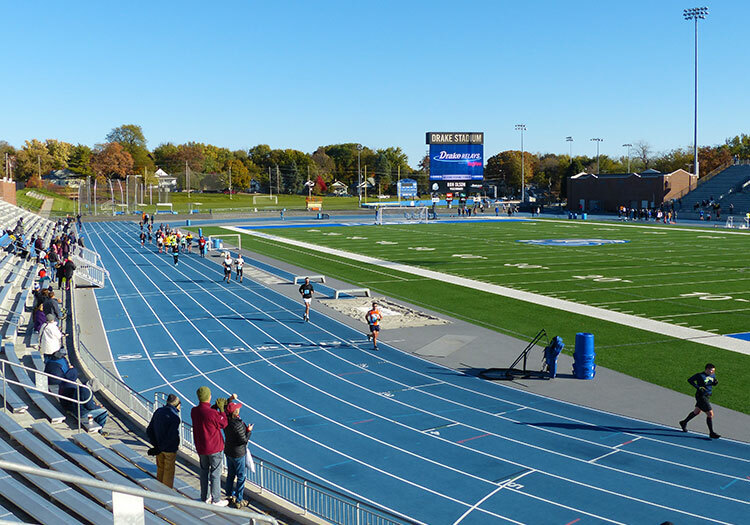 Drake Stadium is a beautiful facility, and I can imagine what a thrill it would be as a college athlete to run in the prestigious Drake Relays on that track. Drake Stadium was the turnaround point of the day’s longest out-and-back (six miles), and by the time we exited I was feeling in a comfortable rhythm and looking forward to the second half of the race. A stiff crosswind — and occasional cold headwind — continued to blow as we retraced our steps through campus, the occasional gust causing fallen leaves to dance across the road like tiny drunken pedestrians. The thing about wind is, it’s public enemy #1 when it blows against you, slowing your progress and draining your energy. On the other hand, when it blows with you so that you suddenly feel a step faster, it often goes unappreciated since you typically can’t feel the wind at your back. In a tailwind, the runner takes the credit; in a headwind, Mother Nature gets the blame. Heads I win, tails you lose. Running is an outdoor sport, though, and a well-timed tailwind can significantly affect the outcome of a race. Such was the case at the 2011 Boston Marathon. Taking advantage of cool temperatures and a brisk tailwind, Geoffrey Mutai of Kenya ran the fastest marathon ever run at that time, finishing in 2:03:02, four seconds ahead of fellow countryman Moses Mosop. (Due to its elevation profile and start/finish separation, Boston isn’t eligible for world records.) Mutai also shattered the course record by nearly three minutes; no winner since then has come within 5½ minutes of his mark. Likewise, American Ryan Hall finished fourth that day in 2:04:58, an American record that stands to this day. “It was at our back,” Mutai said afterwards of the wind. “But it wasn’t such a big wind.” Of course it wasn’t, at least not in Mutai’s eyes, because to admit as much might have diminished his record performance — a performance that by any standard was one for the ages. Aside from the wind, the day was otherwise stunning — crisp and clear, the cloudless sky a particularly striking shade of sapphire. Tentatively I downed my first GU at mile 12.5; my stomach took it well, so that was promising. Seeing the back of my shirt, fellow 50 Stater David from Chattanooga asked, “What is RaceRaves?” He pronounced each half of the name distinctly, like a spelling bee contestant enunciating the word he’s been challenged to spell. And so, as we cruised back along residential Kingman Blvd, I happily shared my elevator pitch for our awesome website/race resource before I found myself pulling away from him. Huge props to the energetic spectator at the corner of Polk and Kingman, near the end of our Drake out-and-back. She was rocking a set of sleigh bells when I first passed her in mile 10, and again still as I approached her from the opposite direction in mile 15. And she shook them with feeling, as though the fate of Christmas (or maybe her own body warmth?) depended on it. She was a one-woman cheer zone, and I waved in appreciation as I passed. 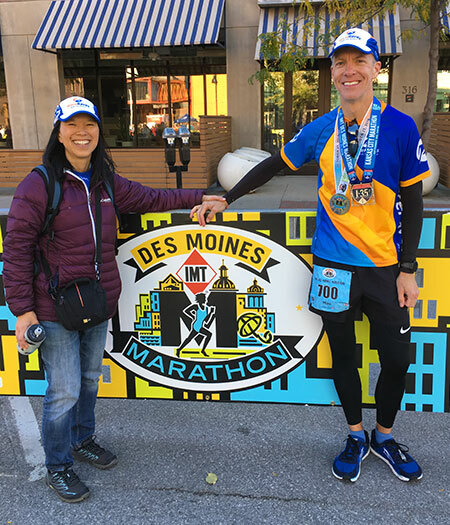 Overall, despite similar finisher numbers and less than half the urban population, Des Moines struck me as having more spectators than Kansas City. And the signage I saw along the course won the weekend as well. Sure, I’ve seen it before — after 35 marathons and 40 half marathons, new spectator signs are tough to come by — but “You’re running better than the government” has taken on new meaning since 2016. And “Toenails are for sissies” is a tried-and-true sentiment that earns an unexpected smile when it’s sponsored by the Des Moines University Foot & Ankle Clinic. 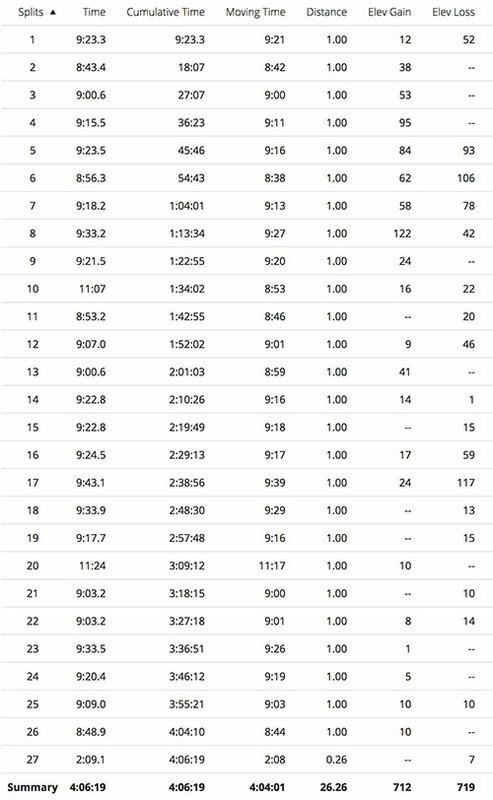 Aside from the Drake track, miles 18-24 are what I’ll remember most about the DMM course. 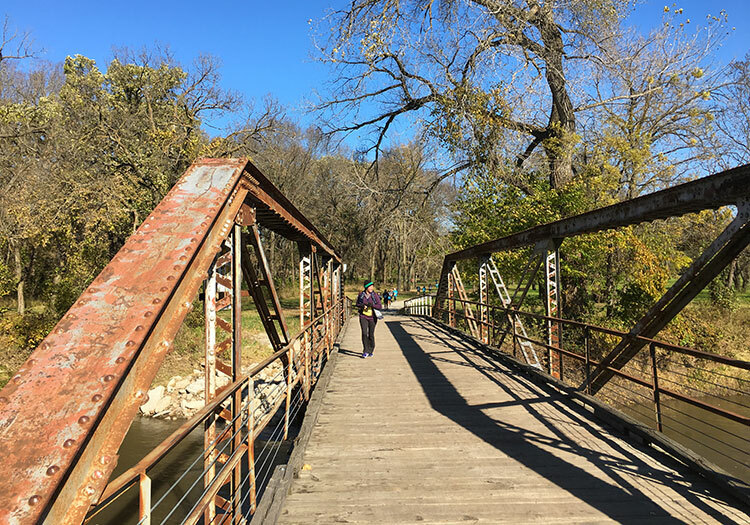 These seven miles comprised a series of interconnected public parks, one transitioning seamlessly into the next as we followed a paved, well-maintained bike path through peaceful wooded stretches, across wide-open green spaces, along the Raccoon River and finally around popular Gray’s Lake. At times the route felt downright bucolic and far removed from city folk — as in, how most Americans envision Iowa. Not to be assuaged by our tranquil surroundings, my mercurial stomach awoke with renewed agitation in mile 20, forcing me to make a second pit stop. Luckily this one was a bit more graceful, and I resumed the race with high hopes for reaching the finish line without further gastrointestinal distress. A boy’s gotta dream, you know? The path in places was strewn with fallen leaves, many of them still green rather than fall’s preferred palette of yellow, orange and red. I glanced up to see large numbers of leaves — maybe primed to fall already? — being blown from their trees by the gusting wind. The displaced leaves fluttered in the air like startled green butterflies, a scene that struck me as strangely curious. Or maybe my second marathon in two days was messing with more than just my stomach. One uniquely cool aspect of Des Moines was the good-natured course monitors who patrolled the route on bikes offering aid, nutrition or simply an encouraging word. 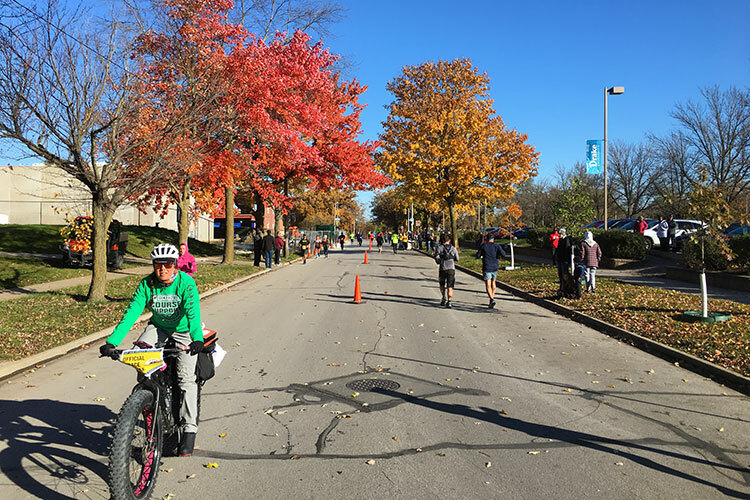 For the novice marathoner or half marathoner, it’s gotta be reassuring to know that if the wheels (yours, not theirs) do fall off during the race, help will quickly be by your side. Leaving Water Works Park, we immediately entered Gray’s Lake Park for a two-mile loop of — surprise! — Gray’s Lake. The deep blue serenity of Gray’s Lake came at a perfect time. As the “Are we there yet?” miles of the marathon, miles 22-24 are among the most challenging, since you’re battling mental and physical exhaustion despite having 15-30+ minutes of running still ahead of you. So any distraction from my mounting fatigue was much appreciated. A nifty foot bridge cut across one end of the lake, offering a skyline view of our final destination in downtown Des Moines. The scene evoked a déjà vu flashback to Omaha, where the neighboring Council Bluffs (Iowa) skyline had beckoned from across the Missouri River near the halfway mark. Two Katie sightings in quick succession — in Water Works Park and then Gray’s Lake Park — likewise were well-timed picker-uppers. Though her seeming ubiquity got me thinking that maybe she’d nicked one of the course monitor’s bikes when their head was turned. Fortunately, and despite my stomach’s perverse rejection of nutrients, I somehow avoided the proverbial marathon wall, maintaining a reasonable pace and passing quite a few runners in the last six miles. I even dared my stomach to protest one final half-packet of GU in mile 22. Luckily it chose not to call my bluff, instead remaining quiet for the final miles. Back out on the main road, I was passed by a ruddy-cheeked, fast-moving runner with seemingly no shortage of energy. Only one thing could explain the oddity of such seemingly fresh legs this late in a marathon: the marathon relay, an event in which each member of a team runs one or more individual “legs” of the marathon, with each leg covering a variable distance for a total of 26.2 miles. Mile 26 featured a return to the industrial straightaway of Martin Luther King Jr Pkwy, where I focused on picking off one slow-moving runner at a time while soaking up the warmth of the noon sun directly overhead. As I ran, I recalled fellow 50 Stater Dan’s own DMM experience on a much warmer day in 2012, when this same stretch of reflective glass and concrete traversed under the heat of the midday sun had proven a brutal final act. Given that he’d clocked a 3:25 on that day, though, I found myself short on sympathy. A ginormous American flag hung across the road ahead of us, and with one last burst of energy I passed several folks who looked to be running on fumes, before leaning into the final left turn. There in the home stretch, I basked triumphantly in the final 200 yards of a whirlwind weekend. Hearing my name announced over the PA, I looked up to see the august dome of the Polk County Courthouse welcoming me back as I crossed my second marathon finish line in roughly 25 hours in a respectable 4:06:18. With that, Des Moines earned the dubious distinction of becoming the first road marathon in 32 tries that I’d clocked in over four hours. It’s a streak I’m modestly proud of, but one which was bound to end at some point given the sheer number of marathons (and ultramarathons) I run. On the other hand, I’d finished within 15 minutes of my Kansas City time, and under the circumstances I could live with that. At no point during the race had I felt overdressed in tights, and in fact I’d been thankful for their warmth and compression, which together acted as a security blanket for my weary legs. Gratefully accepting my DMM medal (woo-hoo!) and I-35 Challenge medal (woo-HOO! ), I exited the finish chute and threw my arms around a Stay Puft-soft Katie in her poofy winter jacket. Then I allowed myself to simply wander in a daze for a few minutes, my shiny new hardware clanging together like wearable wind chimes. Challenge completed. It wasn’t long before the bracing combination of cold temperatures, swirling winds and dappled shade rudely snapped me out of my stupor. 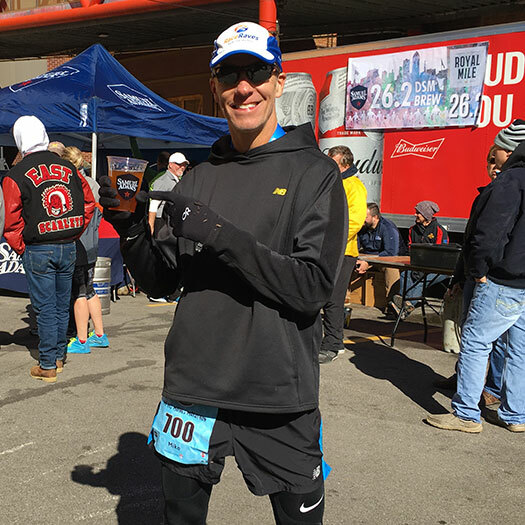 Briefly I thanked Race Director Chris Burch who was overseeing finish line operations, as well as Blake who had made his way to the finish and who, seeing me start to shiver as my body temperature dropped, smartly urged me to throw on some warmer clothes. I grabbed some food and an excellent Samuel Adams DSM 26.2 Brew to wash it down, the latter the sign of a finish line festival designed with its runners in mind. On that note, a word to all races that feature low-calorie Michelob ULTRA at your post-race party: don’t. After running 26.2 miles, the last thing I want is a low-carb post-race beer that pledges not to compromise my “active lifestyle.” That’s what water is for. Au contraire, carb me up. Unfortunately I lingered too long to hit the massage tent before it closed, but no matter — I was feeling remarkably limber after a two-marathon weekend. And for the next two days I’d feel no different than if I’d run a single hard marathon, with the usual post-race lethargy and immune depression. Nothing that rest, nutrition and Game One of the World Series in Boston couldn’t cure! That evening, we followed up a visit to the eclectic Pappajohn Sculpture Park (not to be to confused with the Papa John of racist pizza fame) with dinner and drinks at El Bait Shop, a local hot spot recommended by Blake which boasts the “World’s largest selection of American craft beers,” including a marathon-perfect 262 beers on tap. It was a restful ending to a wild weekend… and the calm before the storm of a wildly rewarding week. On Monday we said our fond farewells to Des Moines and hit the road — I-35, I wish I knew how to quit you — for the return trip to Kansas City. There we hopped a flight to Chicago for an overnight stay with friends Pete and Faby and one-year-old goddaughter Eva, before boarding an early-morning flight to Boston for a Tuesday evening date with Fenway Park and the best World Series matchup of my lifetime, as my childhood Boston Red Sox hosted our hometown Los Angeles Dodgers. By the time the dust settled and the Red Sox captured their 4th World Series title in 15 years, we’d ended up visiting five states in five days. During that time I’d renewed great friendships, visited two vibrant Midwestern towns, notched marathons 35 and 36 in states 22 and 23, and crafted a 3,800-word blog post on Iowa without a single Field of Dreams reference. Good thing too, because I’d hate to be accused of being corny. 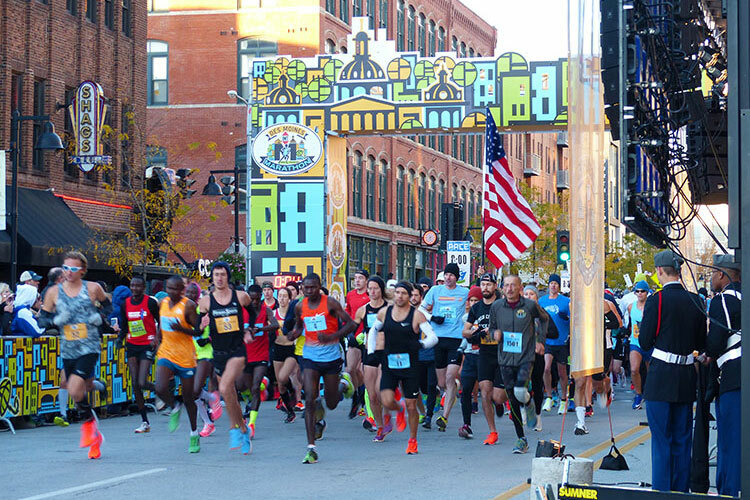 BOTTOM LINE: As midsize marathons go, Des Moines is one of des best in the des Midwest, if not des entire country. The meandering, Hyde-and-Jekyll course is best considered in terms of pre-Drake (rolling first half) and post-Drake (much flatter second half), with the highlight being a lap around the blue Drake University oval in mile 12. 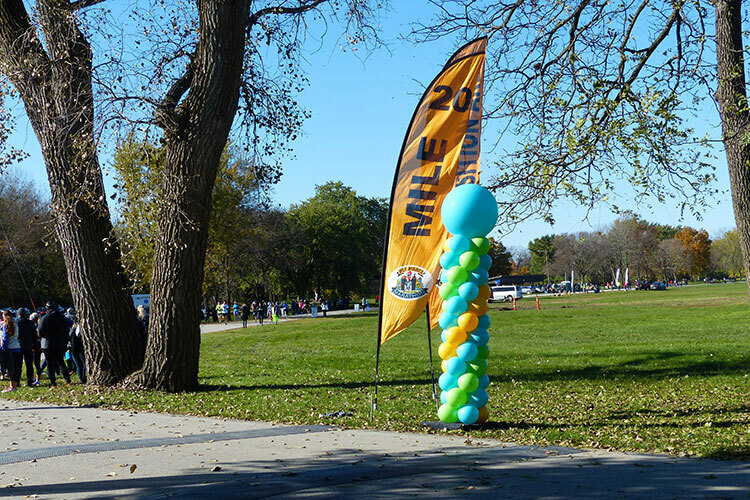 Despite a similar field size, the course felt more suburban and more intimate than had Kansas City’s one day earlier, with much of the route passing through quiet neighborhoods and local parks, including a two-mile loop of serene Gray’s Lake late in the race. That said, the spirited support from the Des Moines community was impressive, including one woman who stood at miles 9.5 and 14.5 shaking her sleigh bells as if the upcoming holiday season depended on it. 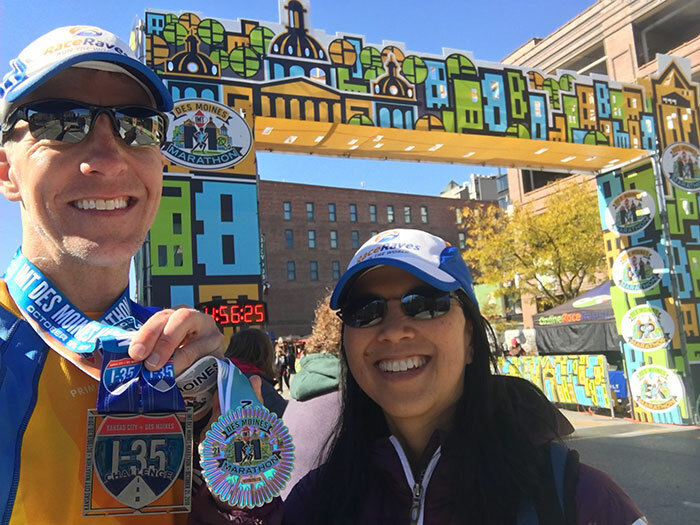 As a spectator Katie drove many of the streets and neighborhoods bordering the course, and in so doing witnessed the more blue-collar commercial and industrial sectors of the city, none of which were immediately apparent to us marathoners. 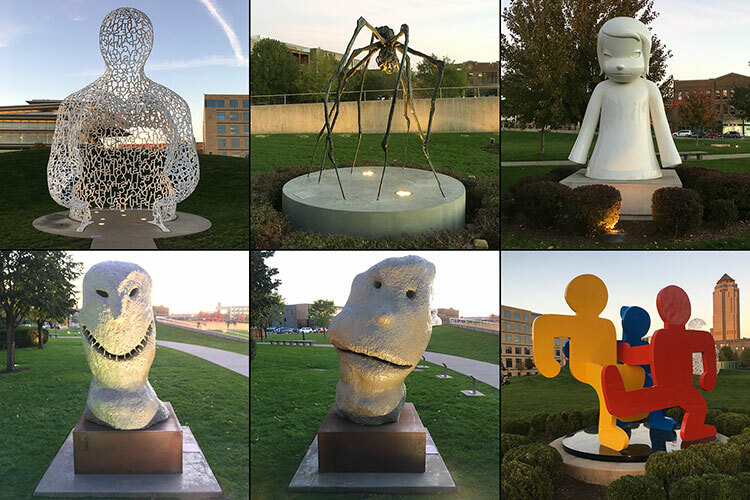 My own impression of Des Moines from race weekend was of a scenic, comfortably sized town with few defining features but with an abundance of green spaces, a vibrant university campus and an artsy, entrepreneurial streak. And finishing 26.2 miles in the shadow of stately Polk County Courthouse was a nice touch. 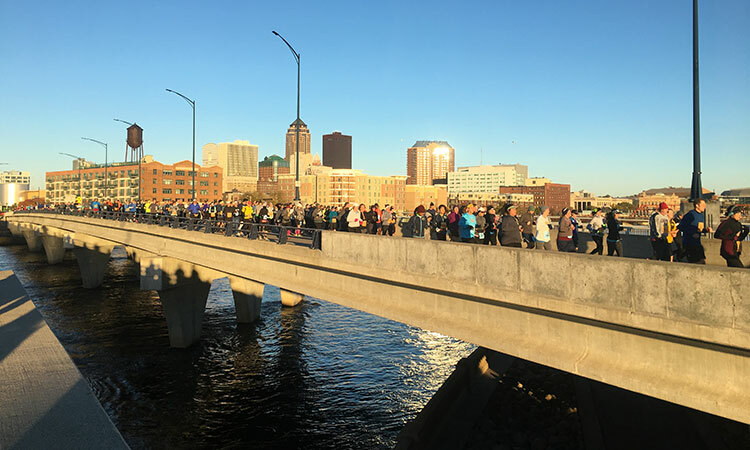 PRODUCTION: Des Moines was staged with clear attention to detail, from the scenic course that showcased the best of the city to the plentiful aid stations (and porta-potties) to the helpful volunteers who patrol the course on bikes, acting as mobile aid stations. And though the finish line festival (or in this case, the Samuel Adams Block Party) was a good bit colder and windier than the previous day in Kansas City, I stuck around to thank Race Director Chris Burch in person, and to take advantage of the free post-race nachos and Sam Adams DSM Brew, never a bad combination. Unfortunately I missed the complimentary massage tent, but that too was available to sore-legged finishers. A handy pocket-sized Spectator Guide was available at packet pickup. The guide featured a map of the course showing the locations of cheer zones and parking lots, as well as helpful hints including the Sunday schedule, how to get connected with your runner and when/where to watch on race day. Super-spectator Katie found the guide to be particularly helpful in association with Google Maps. One suggestion I might make would be for pacers (who always amaze me with their ability to lead, inform and entertain, all while maintaining a consistent pace for 26.2 miles) to carry signs that more clearly identify their pace times — the pace signs this year were difficult to read from a distance, which frustrated me on several occasions as I tried to gauge my progress based on a pace group running ahead of me. SWAG: Des Moines overdelivered in the swag department. While the shiny round finisher medal emblazoned with the race logo is an eye-catching addition to my collection, it’s overshadowed by the high-quality full-zip jacket with the IMT DMM logo printed on the left lapel. Not only is the jacket a thoughtful and significant upgrade from the usual race tee, but it’s the type of outerwear I’ll find a reason to wear even in SoCal, as it’s both comfy and stylish. In addition to race-specific swag, marathoners and half marathoners who also completed Kansas City the day before earned 1) a colorful stained-glass I-35 Challenge medal with the names of both races on the medal and ribbon, and 2) a long-sleeve gray tech tee with “Challenge Completed” printed on the front. 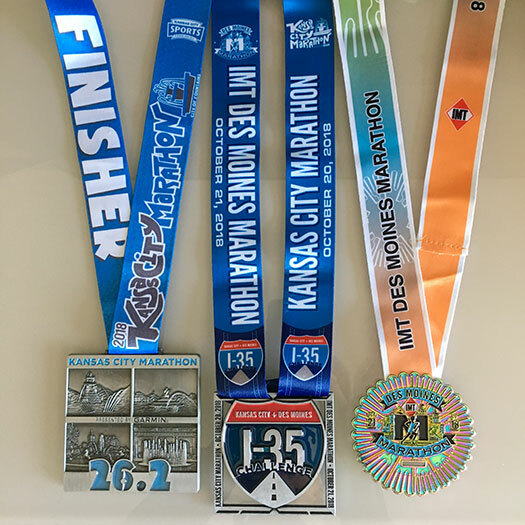 Hats off to the organizers in Des Moines and Kansas City for going the extra mile to make the I-35 Challenge one of the most memorable weekends in running!